It’s chicha, hindi chacha. For three consecutive years now, working class issues such as wage hike, controlling inflation, reducing poverty and job creation remained as Filipinos top concerns while charter change or chacha just hang around to be the least. Yesterday dozens of PM members among workers, women and youth led a picket at the Department of Trade and Industry office in Makati to assail government's inaction on inflation and its pro-endo policy. 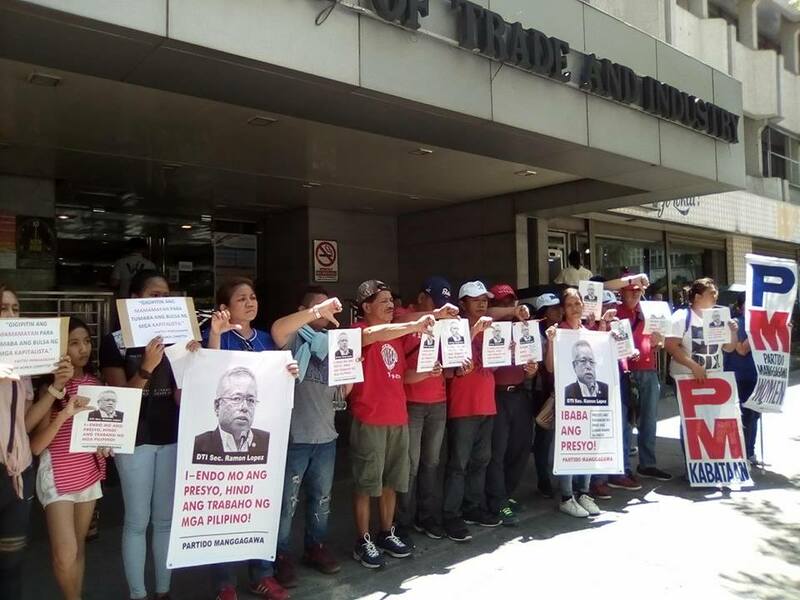 The protest was a buildup to the massive labor unity mobilization planned on May 1 to push for workers' demands such as regular jobs and a living wage. According to PM chair Renato Magtubo, poverty concerns had always been in need of immediate action and unless addressed in a holistic manner, these issues will continue to hound any administration. “Ang mas kailangan ng mga Pilipino ay chicha, hindi chacha,” said Magtubo, adding that the failure of President Duterte and his Congress to stop contractualization, abolish the regional wage boards, and to control the rising prices of goods and services due to the imposition of new taxes will always’s be viewed by the working class as a regression rather than an improvement in their quality of life. Chicha is a Filipino slang for food, but for the labor group, its meaning expands to other rights and entitlements that enable workers to raise their standard of living. The most recent Ulat sa Bayan report by Pulse Asia revealed that the first three concerns remained to be the issues that most Filipinos want the Duterte administration to address. The survey conducted between March 23-28, 2018 showed that wage hike, controlling inflation and reducing poverty were the top three concerns while charter change landed last in the list with only 3% of Filipinos demanding immediate action for it from the President. Magtubo said the same sentiments will surely be expressed by workers who will be mobilizing themselves nationwide in the coming Labor Day celebration.